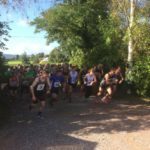 Sixty runners entered this years Big Dipper 10K in Upton Bishop on Sunday 25th September. They came from as far as Preston and Llanelli and ranged in age from eighteen to seventy- three years. 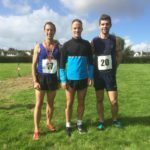 Simon Lewis from Parc Bryn Bach Running Club made light work of the hills to win the men’s race ahead of local postman Darren Ramage. Luke Gray was third man and led home five entrants from the Gray family. 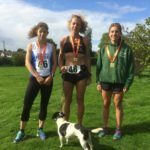 Angela Jones from Usk Running Club belied her fifty years with an impressive win for the ladies in a new course record. Kate Owen of Wye Valley Runners and Laura Lelievre of Monross Trailblazers followed her. Children’s races, free tea and cakes and a medal for all finishers made a really enjoyable event. Upton Bishop Sports and Social Club is grateful to their sponsors: Chaseview Veterinary Clinic, RP Joinery, Newent Auto Centre, Fleetcare Services and Cicory Crops.